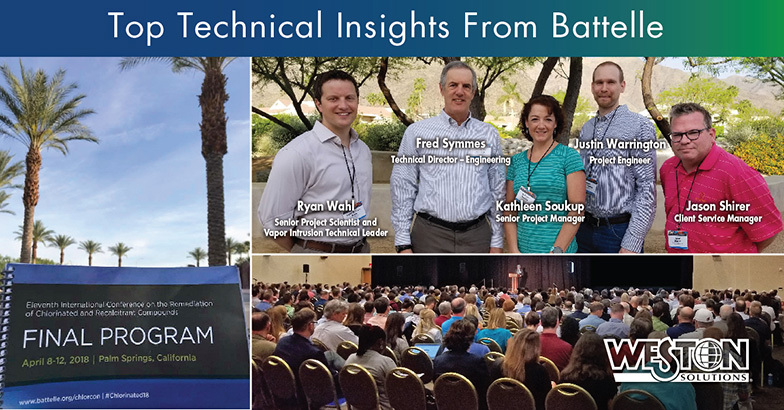 Weston professionals attended the Battelle Conference on Remediation of Chlorinated and Recalcitrant Compounds in Palm Springs in April 2018. Five Weston remediation professionals with various technical backgrounds participated at this major event to benchmark progress in addressing these compounds across the marketplace. Our team comprised Fred Symmes (Technical Director – Engineering), Kathleen Soukup (Senior Project Manager), Ryan Wahl (Senior Project Scientist and Vapor Intrusion Technical Leader), Justin Warrington (Project Engineer) and Jason Shirer (Client Service Manager) attended to maintain and further Weston’s over 60-year track record of providing cutting-edge solutions to solve complex environmental and infrastructure challenges. Hot topics included Vapor Intrusion evaluation methods, Poly- and Perfluoroalkyl Substances (PFAS) precursors, Electrokinetically-Based Remediation, Thermal Remediation technologies, and more described below. – Multiple Lines Of Evidence (MLE) – USEPA presented on this topic and communicated that regulatory agencies continue to change and push MLE for vapor intrusion (VI) evaluation to avoid false negatives/positives. However, when using MLE, no single investigation result is considered definitive. According to USEPA, data collection should be based off different factors identified that influence the preferential pathway to streamline efforts for efficiency. Multiple datasets and investigation results are evaluated collectively to determine whether there is VI pathway or not. Acquiring data from MLE forces investigators to cross check and confirm their findings with other scientific methods. – Value Of Building Differential Pressure Measurement – The pressure difference between a building and the subsurface has a major impact in controlling the direction of airflow through the building foundation. A small positive pressure can effectively suppress VI just as a small negative pressure can initiate VI. This is why it is critical to measure building differential pressure during indoor air sampling events. When the building differential pressure is positive, there is a good chance that volatile organic compounds (VOCs) detected in indoor air samples are not from the subsurface. Understanding building differential pressure will serve as a solid line of evidence. Building differential pressure in many cases can be manipulated by using the heating ventilation and air conditioning system. A controlled negative differential pressure environment is one way to identify near worst-case scenario conditions for VI of VOCs to indoor air. Weston has Communities of Practice that connect employees across the company, so we can grow our technical excellence by sharing best practices and resources. Employees gain exposure from projects throughout the company and share knowledge with others working through similar technical challenges. These Communities of Practice provide the platform of communication needed to deliver the Vapor Intrusion takeaways described above. – While USEPA has not set an MCL for any PFAS at this time, they have set a Lifetime Health Advisory (LHA) of 70 nanograms per liters for (Perfluorooctanoic Acid) PFOA and (Perfluorooctyl Sulfonate) PFOS, individually or combined. However, the total PFAS suspect list includes some 1,500 compounds and most sites have 10-100 PFAS compounds – not just PFOA and PFOS. There are many precursor compounds that can be transformed into PFAS. One presenter triggered a series of questions. Should we be looking at precursors even though they are not regulated? Should we look at those that can turn into PFOA and PFOS? How can we evaluate what conditions (subsurface or applied treatment technologies) can transform precursors into “undesirable” PFAS. An example was used by the presenter. Oxidation processes in wastewater treatment plants could be inadvertently transforming precursors into PFAS. It was presented that testing the influent and effluent water could be important in some situations. While running tests like a Total Oxidizable Precursor assay may provide additional data, it was not clear what the results mean, especially those compounds other than PFOA and PFOS? Advances in lab technologies allow us to see more precursors and PFAS compounds, but there is a lag with the toxicology and risk assessment of PFAS. Weston monitors closely the progress being made in addressing PFAS. Weston works closely with the laboratories to determine the best analytical method and compound list for sites based on their geographic location and known contaminants of concern. As a recognized leader in addressing PFAS in the environment we have established strong working relationships with clients, regulators, stakeholders, and laboratories making us a trusted provider when evaluating PFAS at sites. – EK-based remediation involves the application of low density direct current (DC) to the subsurface. An electric field is created by inserting electrodes in the contaminated site and passing low density DC making the contaminant particles mobile in the soil media. The contaminants get transported towards the electrodes, and they are pumped out. EK remediation is particularly useful in soils with low permeability (clay or till) and heterogeneous environments (mixtures of sand and clay) where other common remediation technologies may only partially treat the site. EK remediation can also be integrated with other technologies. For example, a routine In-Situ Chemical Oxidation (ISCO) application in a heterogeneous subsurface of sand with clay layers may quickly reduce contaminants within the sand layers, only to leave behind contaminants in the clay that will leach back into the groundwater. An electric field can be applied to move the oxidant into the clay layer for more successful treatment. Weston is well positioned to successfully implement EK-based remediation in the field. Our project team of scientists and engineers have been highly successful with in situ remediation, including ISCO treatments and thermal remediation techniques. Using EK to move contaminants or enhance amendment delivery to complete treatment of low permeability areas could be the finishing step at complex sites, and Weston has the resources to make it happen. – Making The Right Choice Between Remediation Options – Thermal remediation is a proven supplementary technology that can be added to a treatment train to further remediate a site. Thermal can enhance bioremediation, in-situ chemical oxidation and some pump and treat applications. Although it can be more costly than other technologies, there is a certainty to its effectiveness for destruction of VOCs and non-aqueous phase liquid (NAPL) sources. There are primarily three types of thermal remediation used today including conductive heating, steam, and electrical resistance heating (ERH). A comprehensive Conceptual Site Model will determine the most effective, cost efficient technology: a type of thermal remediation; a non-thermal remediation; or combination of multiple technologies in a treatment train. – O&M Costs Are An Important Consideration In Choosing System – 90% of volatile contaminants are contained in vapor phase while 10% are liquid phase. Supplementing an existing soil vapor extraction (SVE) system with ERH and steam will volatilize and mobilize contaminants that may not have been effectively removed using the existing system. When choosing a technology, consider operations, and specifically, maintenance costs on running the system instead of the upfront cost. Long lead times on expensive components or difficult to repair equipment can quickly become more expensive than the upfront cost of a simpler but more costly solution. – Bench & Pilot Scale Studies: Worthwhile Tools – Bench scale studies will provide breakdown products of contaminants at various temperatures allowing a contractor to dial in a temperature for which to run a pilot scale operation. 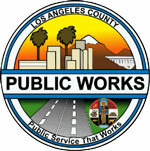 A pilot scale study will provide information as to the proper well spacing for a larger scale thermal remediation. Evidence continues to support bioremediation being enhanced by an increase in soil temperature. Coupled with vapor and liquid extraction and treatment with granular activated carbon, thermal enhanced bioremediation remains an effective means of removing VOCs from a contaminated site. Weston has been successful in developing solutions and working with others to remediate complex sites utilizing ISCO, pump and treat systems, bioremediation, SVE systems, and other technologies either as standalone or part of integrated treatment trains. Weston has demonstrated capability in developing bench and pilot scale studies to provide an authentic model to determine whether or not a component of a treatment train solves our clients’ remediation needs. Weston is well positioned to evaluate a given site and team with a thermal contractor to provide thermal remediation as another means to remediate complex sites where a single technology is insufficient to meet clean-up criteria.